Coach's Corner - Tony Gwynn hand signed/certified Padres Mitchell & Ness jersey. 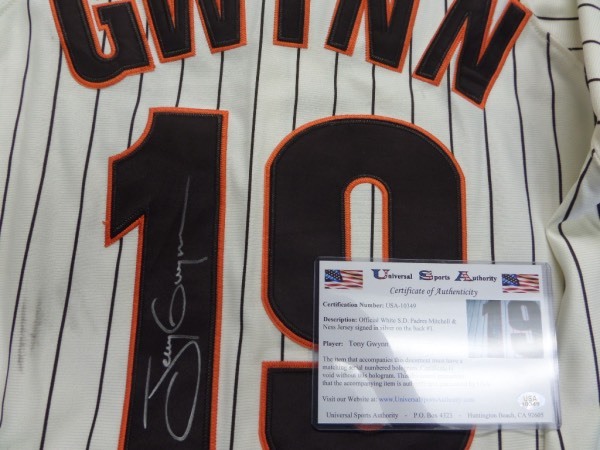 Go Back to Lot List Tony Gwynn hand signed/certified Padres Mitchell & Ness jersey. This mint home white pinstripe style is a beauty, tagged right by Mitchell & Ness and NOT a cheap knockoff. It has sewn on everything as well as name on back, comes trimmed in team brown and orange colors, and comes back #19 signed by the late, great 3000 Hitting HOF slugger. It is a 10 all over the place, shows off well from across our auction room, and even has a lifetime USA added hologram for assurance.